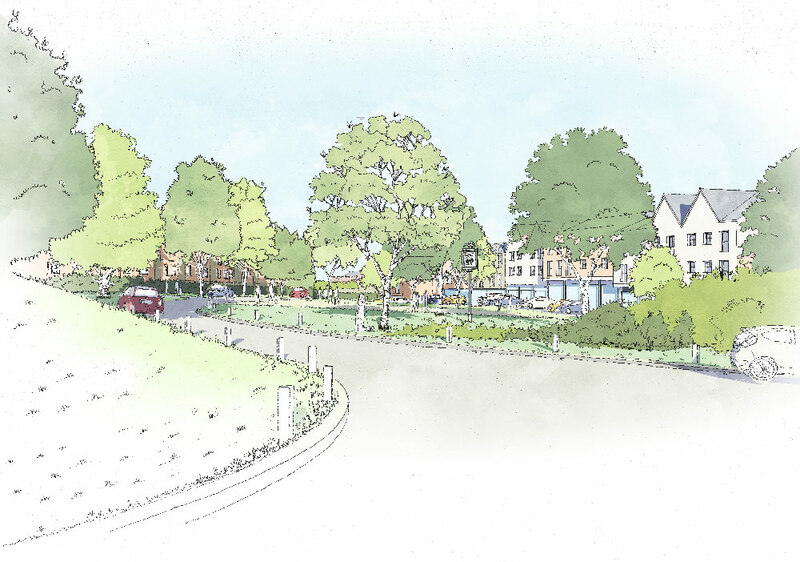 Countryside is pleased to present proposals for the development of a new neighbourhood at Bishop’s Stortford South. We are seeking your views on the proposals and the draft masterplan. 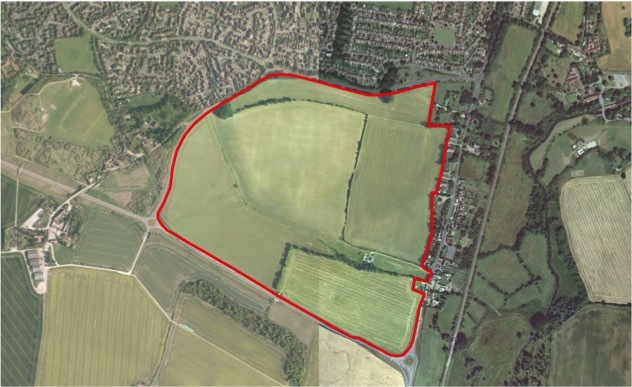 Countryside is proposing to develop a sustainable new community, known as Bishop’s Stortford South, on land lying to the west of London Road/Thorley Street and north of St. James’ Way bypass (A1184), in accordance with East Herts District Plan draft Policy BISH5. 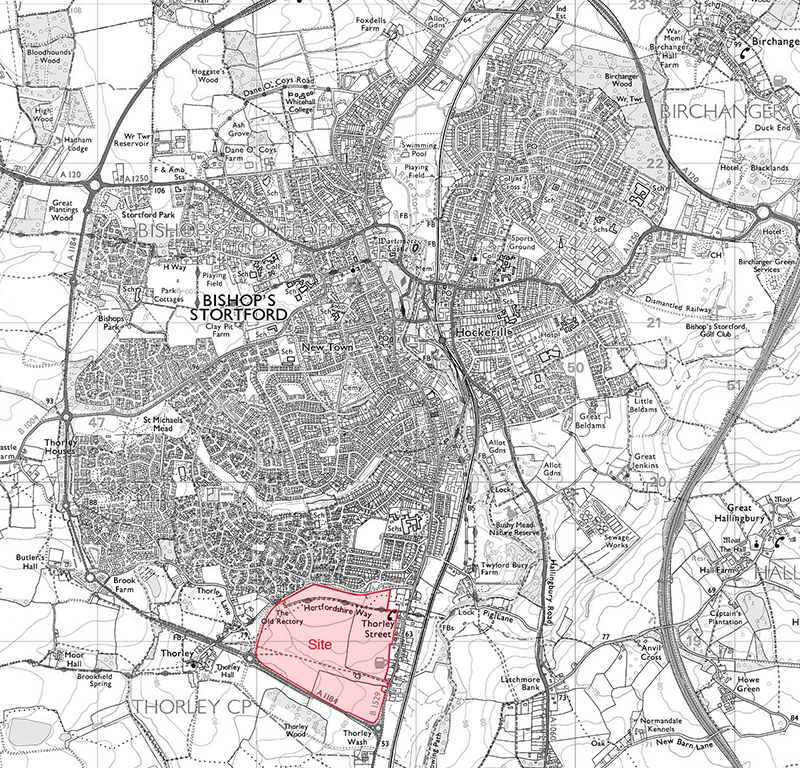 Our proposals for Bishop’s Stortford South will allow for a mix of uses on the site, with new homes including a care home and affordable housing, provision of nursery, primary and secondary education, job opportunities through a new local employment area, as well as community and retail services to serve the day to day needs of the neighbourhood. 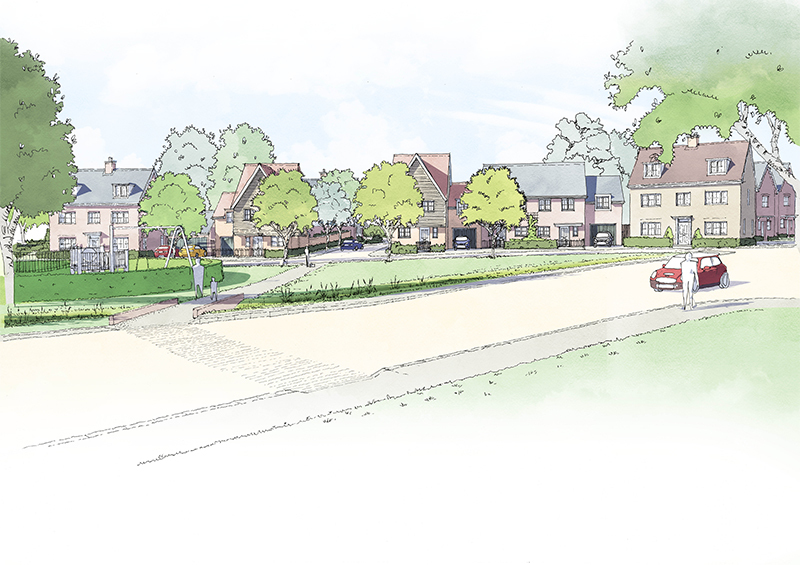 We hope to create a welcoming village community that caters to all ages and develop not just new homes, but a place where people will want to work, live and play and grow a sense of ownership for the long-term. Countryside is a long established housebuilder specialising in place-making and urban regeneration. We take pride in the quality of our developments, and have an award winning reputation for our carefully considered landscape-led approach to masterplanning and design. 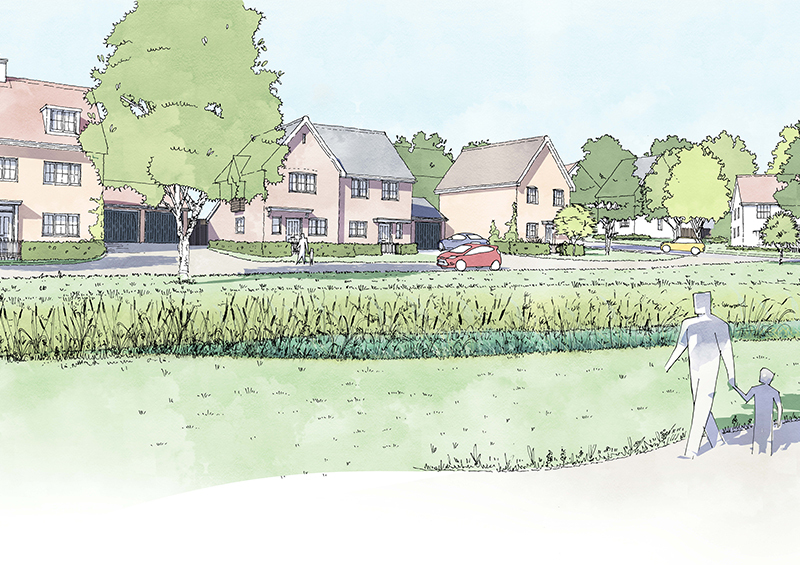 Countryside’s emerging proposals will allow for a mix of uses on the site, to support a sustainable community. We look to use our creative place-making skills to create an environment where residents feel a true sense of belonging and are proud to call home. 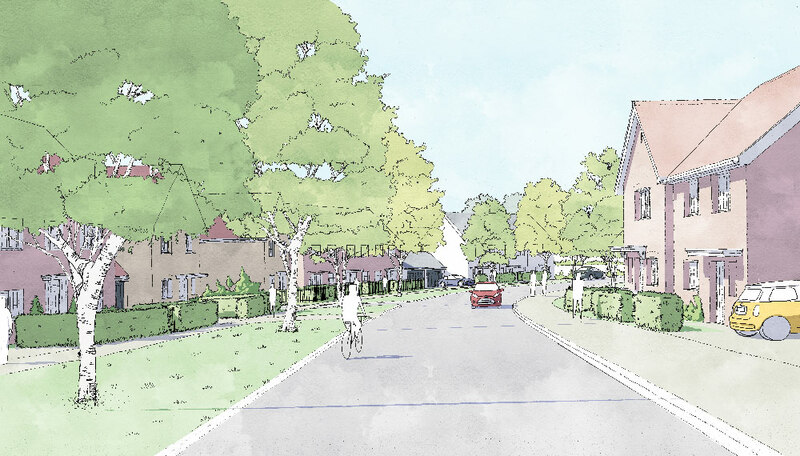 We achieve this by carefully masterplanning our developments to integrate new facilities so they can benefit residents, delivering necessary supporting infrastructure and placing an emphasis on landscape-led design. 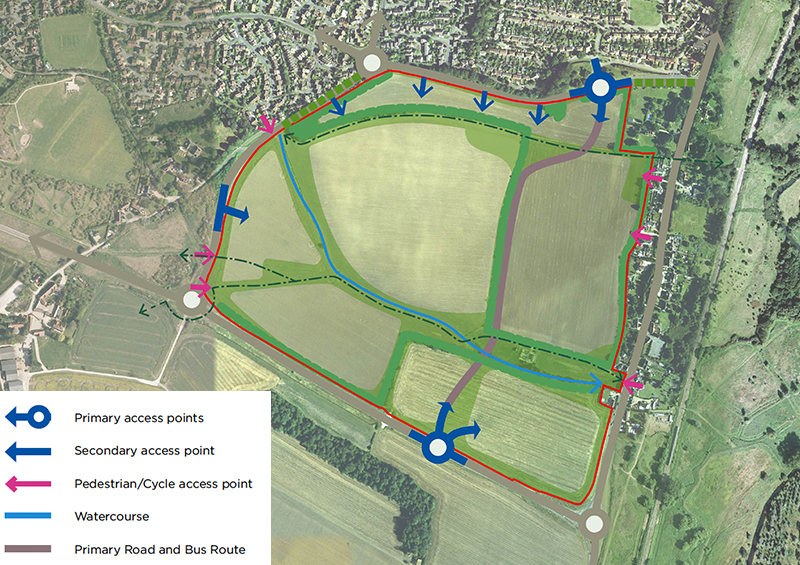 Emerging proposals have sought to maintain open views from the high ground and from the Hertfordshire Way, determining the position of the schools with playing fields on the higher parts of the site and the buildings at the lower levels, providing unobstructed long-distance views along the Stort valley to the southeast. Countryside have commissioned a team of consultants to undertake a range of detailed assessments of the site. The route of the existing Public Rights of Way will provide a network of multifunctional open spaces. A character study has been carried out to gain an in depth understanding of the local context and ensure that proposals reflect the rich heritage of Bishop’s Stortford and its hinterland. The local built character has been analysed at a number of levels including settlement structure, streets, open spaces, existing architecture and materials. We are seeking to provide a rich variety of traditional streets and spaces throughout the new neighbourhood. Five key areas have been illustrated in more detail on these banners to demonstrate how the local character is reflected in the emerging illustrative masterplan proposals. It is envisaged that the development will comprise a mix of housetypes, for smaller households (1 and 2 bed apartments) and family housing (2, 3, 4 and 5 bedroom, a mixture of detached, semi-detached and terraced homes with private gardens). The village greens are smaller, more intimate public spaces scattered around the development, often containing play spaces and overlooked by houses. These areas create a linked frontage to ensure a good sense of enclosure. The diversion of the main street allows views of key buildings from both approaches and therefore aids way-finding within the development. The spaces will be naturalistic in appearance with native trees and meadow grass. There will also be spaces for informal play, relaxing and to provide a setting to the buildings. Play provision within these spaces will continue the theme of natural play adopted throughout the site. The green corridor is an important spine that runs through the centre of the proposal, providing a multifunctional role. A sitewide sustainable drainage scheme linked to the watercourse will improve water levels and water quality in the watercourse as well as provide new riparian habitat such as reed beds and increased plant diversity. 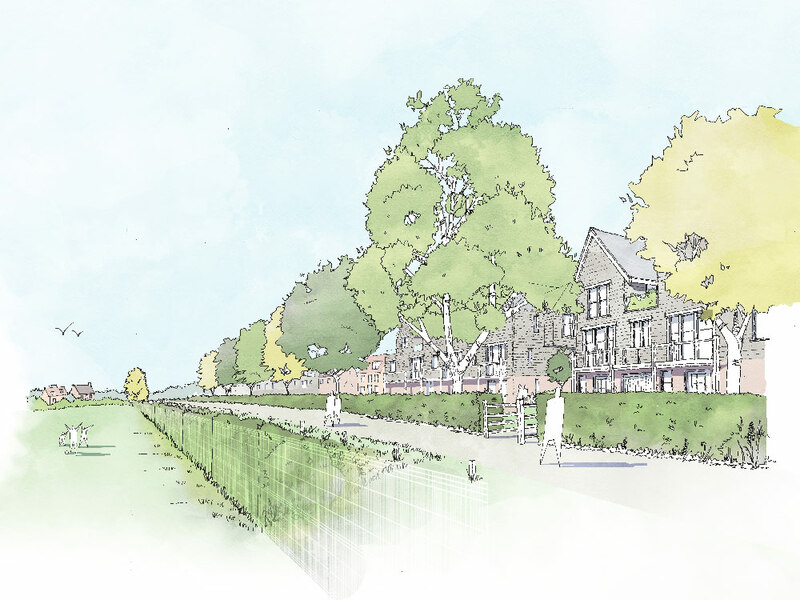 The corridor will be overlooked from at least one side along its length providing pleasant views, and will include extensive areas of informal open space and opportunity for gentle recreation and quiet enjoyment of wildlife. It will be important to secure the long term management and maintenance of any public open space for the bene t of the community in perpetuity. Countryside have worked with the Land Trust, a national non-pro t organisation, with great success at their Beaulieu development in Chelmsford. This joint working has enabled the Land Trust to take on ownership and manage the public open spaces. The Land Trust is an ideal partner for Countryside as its charitable aims and objectives are entirely in line with Countryside’s aspirations for Bishop’s Stortford South. The Land Trust’s charitable aims include community cohesion, education and life-long learning, health and economic vitality through local job creation and supporting safe environments and healthy lifestyles. To the east of the site, key green streets will feature a single double width grass verge to allow for the planting of larger scale trees. These trees will contribute to the streetscene and help break up the roofscape from external viewpoints. These streets will provide an attractive connected network, particularly for pedestrians and cyclists. The Land Trust organise an active calendar of events for the community on the spaces they manage. In practice, community representation on the management committee ensures an ability to be exible in the levels of maintenance and management charges. The Southern Gateway will be formed around an open space overlooked and enclosed on two sides with buildings. The space will be semi-formal in nature to reflect its position in the higher density part of the site. Planting will be limited to large trees and grass, with areas of bulb planting. A mix of facilities is proposed fronting onto the north-south route from the local centre and care home, past the schools up to a village green in the north. The Southern Gateway will act as a community hub with opportunity for a local café, retail and convenience shopping. The local centre will seek to take design cues from the high street character of Bishop’s Stortford, in particular North Street, located within the historic centre, in its roof form and height. Proposed commercial uses within the site could make reference to 19th Century buildings through their layout, materials and detailing. Countryside’s proposals will deliver a number of economic, social and community benefits. The Southern Gateway provides a key primary access from a roundabout on St James’ Way, enabling the separation of employment related traffic. 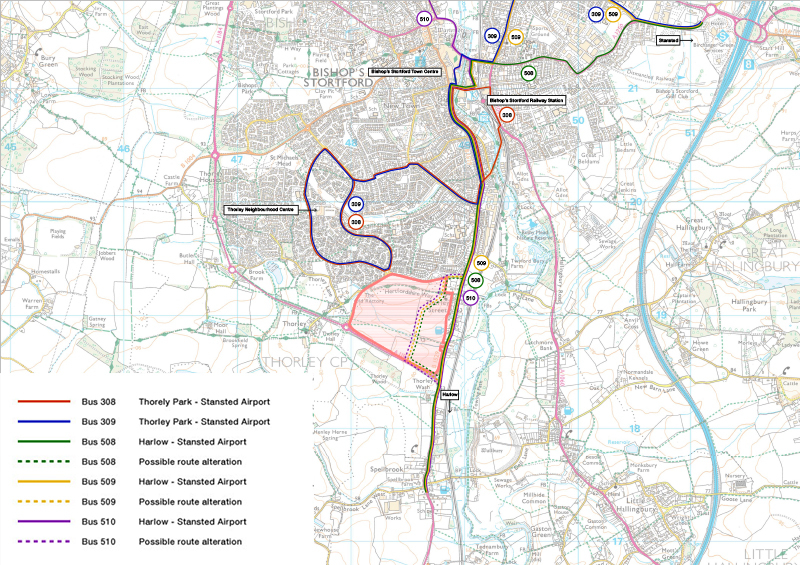 The north to south link through the site will be designed to a 20mph speed limit in accordance with the criteria set out in the Neighbourhood Plan. This will mean that movements to and from the southern part of the site, including the school, will be encouraged to use the proposed access roundabout on St James’ Way, thereby minimising the movements entering and leaving the site from Whittington Way. In consultation with HCC, the Local Highway Authority, and with full awareness of other initiatives coming forward in the town centre, a Transport Strategy is being prepared to support the proposals. Measures to improve bus services and encourage journeys by bus. Measures to improve pedestrian and cycle linkages. The introduction of these measures will be accompanied by an awareness strategy. To ensure that all future residents understand the options available to make journeys by non- car means, information on future bus times, where buses stop, and walking and cycle routes will be extended to the immediate neighbourhood around the development. Clearly, not all journeys will be made by non-car means as a result of personal choice and convenience. Therefore modelling is being undertaken with HCC, and particular consideration is being given to improving the flow of traffic on London Road. The Hertfordshire Way is a long distance public footpath that passes through the site over the crest of the hill. It is not open to use by cyclists. 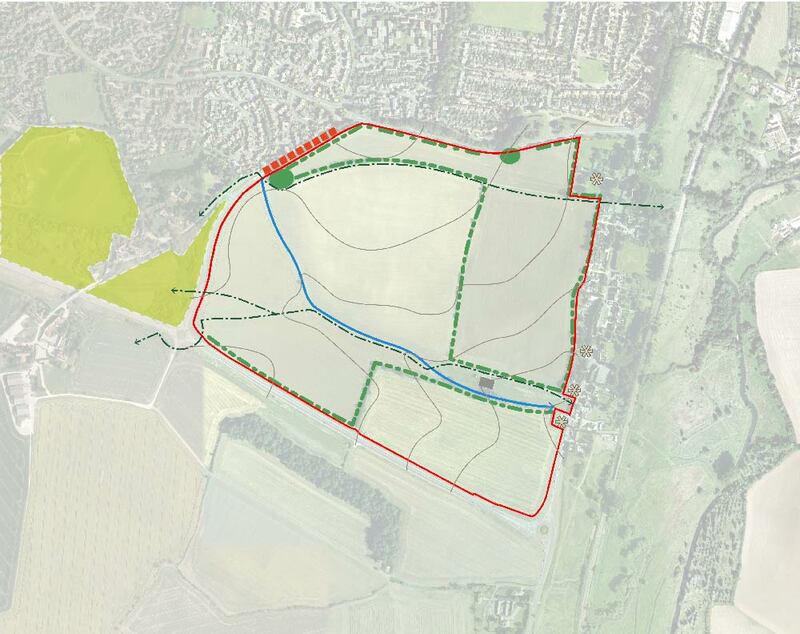 The paths through the site will be open to all users, dog walkers and joggers, and provide informal connections to the wider countryside, the Southern Country Park and a town-wide route. The site is within a convenient walking distance of local facilities at the Thorley Neighbourhood Centre, and within a cycle journey of the town centre and the railway station. 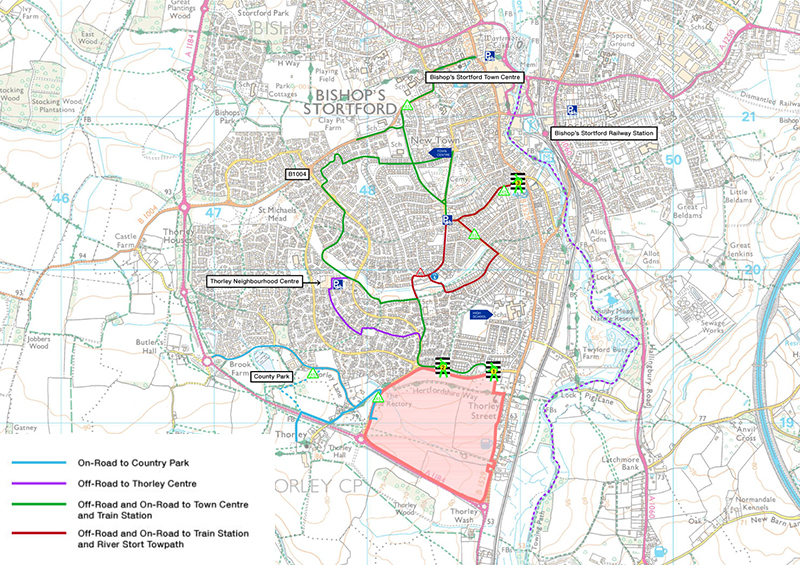 Wider studies are being undertaken in relation to how more journeys could be made by cycle and on foot in Bishop’s Stortford, particularly by SUSTRANS, who understand the constraints that exists within the town. The route through to the centre of the town, in particular the connections to the railway station where the Council have recently approved a Master Plan to provide a link from London Road to the railway station and improved connections to the bridge over the River Stort. Awareness will be a major part of encouraging people to walk and cycle as well as the improved linkages. Each use within the masterplan will have a Travel Plan, which will include the requirement to provide maps of how people can make journeys on foot and by cycle, and provide cycle training for residents. Countryside will introduce new bus services for the development, to seek to encourage people to make journeys by bus through the provision of high quality information and initial free travel. Countryside have found that once people get used to making journeys by bus during the incentive period, then a considerable proportion continue to make journeys once the incentive period finishes. Countryside are working with HCC and the local bus operator Arriva in terms of the bus proposals for the development, and in particular the scope to introduce new services for the emerging proposal and the surrounding area. The site is readily accessible for the station by bus, but one of the key issues is ensuring the bus times are linked with train times. At Beaulieu in Chelmsford, Countryside have introduced a new bus service which is scheduled to arrive at least 5 minutes before a train departs and leave 5 minutes after a train arrives. This is in addition to ensuring that bus services start early in the morning and finish late in the evening, so it is a valid option for those who have to start early or stay late for any reason. This attention to detail can make a considerable difference to how many people travel, and for their Beaulieu scheme in Chelmsford, nearly 25% of journeys in the peak period are made by bus, which is over double that which occurs in the local area.